Patrol 49, U-132 under Ernst Vogelsang, 3 days July 30 to August 1, 1942. 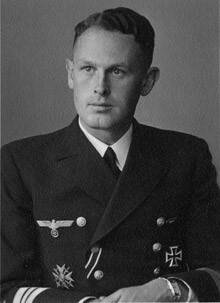 Kapitänleutnant Ernst Vogelsang brought his command, U-132 into New England waters for a brief incursion between the 30th of July and the 1st of August. The submarine merely dipped westwards from a point less than 100 miles south of Cape Sable Nova Scotia, and after the 31st of July turned eastwards and exited the region the following day. Although Vogelsang sank five ships during this patrol and one of them, the Pacific Pioneer, was sunk on the 30th of July, all of them were sunk outside of New England waters. The Anastassios Pateras, Hainaut and Dinaric were sunk on 6 July from Convoy QS 15 and the Frederika Lensen from Convoy QS 19 on the 20th of July. (The Frederika was towed by the corvette HMCS Weyburn but ended up breaking up). During this patrol Vogelsang probed far up the St. Lawrence River as well as the Strait of Belle Isle and the Gulf of St. Lawrence. This patrol began in La Pallice on the 10th of June and ended there 68 days later on the 16thof August. It +was an eventful patrol, starting with participation in a line of U-boats called Endrass in mid June to catch Convoy HG 84. Then on 13 June the boat was surprised by a corvette and her periscope damaged from some of 106 explosions. The boat was refueled by U-460 mid-Atlantic. After its attack on Convoy QS 15 in the St. Lawrence River the minesweeper HMCS Drummondville tried to ram U-132 (Wynn, Vol. 1, p.108). The boat submerged to nearly 600 feet to avoid further damage. Even after attacking the Pacific Pioneer the sub was attacked by its escorts with depth charges. Ernst Vogelsang was born in Frankfurt in August 1911 and perished in November 1942 at the age of 31 when U-132 was sunk near Cape Farewell, Greenland. A member of the Crew of 1931 he participated in the Spanish Civil War (Uboat.net). Then from 1938 to 1940 he participated in the invasion of Norway aboard the destroyer Z-5, Paul Jacobi. Ernst Vogelsang destroyed 10 ships over his career for 39,496 tons including the USS Alexander Hamilton, and damaged another for 6,690 tons. He was awarded the Spanish Cross in Bronze with Swords as well as the Iron Cross 1stand 2nd Class.